Here is another interesting product from Jasmine Model. 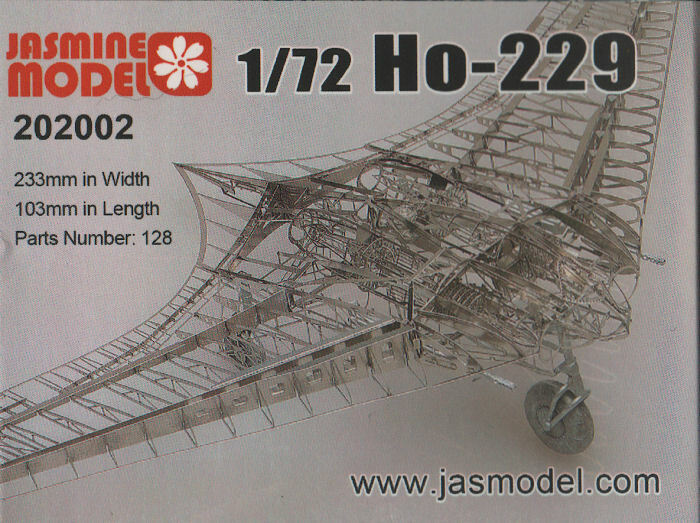 This is a photo-etched kit of a Ho 229 skeleton. The kit is 1/72 scale and goes together with some simple cutting, folding, and a touch of cyano here and there. The kit has a nicely illustrated instruction sheet printed in color to show where to cut, where to fold, and which piece slips into which slot along the airframe assembly. The kit comes on two frets of photo-etched parts plus a set of white metal parts representing the landing gear and two cannons. The large metal nosegear doubles as ballast to ensure your skeleton airframe will sit properly upon its landing gear. Reviewing the instructions, there is a bit of origami required in the center section of the wing as there are a number of structures that will go together with care. What is surprising is that most of the outer wing panels only require folding of the parts, notably the ribs, as they're already attached to the spars. As complex as this kit looks, when you take a step at a time using the well-illustrated instructions, the project is really rather straightforward. Jasmine Model did a really nice job of creating a photo-etched airframe that requires just a little more folding than assembly and should be a relatively quick build. This will make into a very nice display model for your desk or display case. My sincere thanks to Jasmine Model for this review sample!